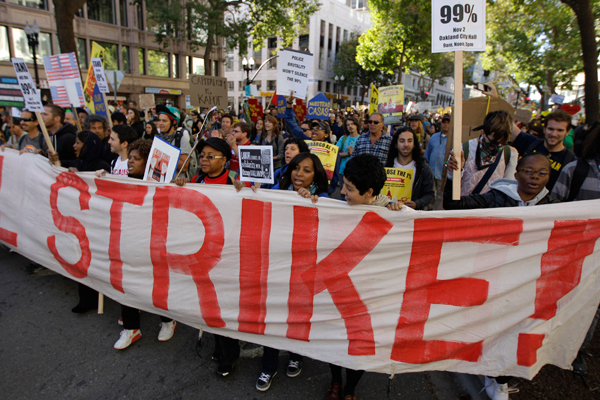 The right to strike is an essential element of freedom of association and collective bargaining. Global unions are determined to defend this fundamental right around the world against attacks from employers and governments. Earlier in June, the employers’ group continued its attack against the right to strike at the annual conference of the International Labour Organization (ILO) in Geneva. After the employers demanded a disclaimer outruling the right to strike, the Committee on Applications remained without approved conclusions on 19 important cases. The offensive started at the International Labour Conference in June 2012, when the spokesperson of the employers’ group unexpectedly announced that that the right to strike does not exist in international law. The employers refused to agree to a negotiated short list of countries that included any case where the right of strike was involved, provoking a deadlock. This attack follows more than 50 years of consistent international jurisprudence that is contrary to the employers’ new line. Even thoughILO Convention 87 on freedom of association and right to organize does not explicitly mention the right to strike, the Committee on Freedom of Association (CFA) and the Committee of Experts have since the 1950s regarded article 3 of the Convention as encompassing protection of a right to strike. In the 1983 General Survey, the Committee of Experts reiterated a conclusion that the CFA had already reached: “The right to strike is one of the essential means available to workers and their organizations for the promotion of their social and economic interests”. This met with no opposition from employers at that time. No union goes on strike light-mindedly. But in our thinking the right to refrain from work is essentially linked to freedom of association and collective bargaining. As ITUC’s fresh brief points out, without the right to strike, a right to collective bargaining amounts to no more than a right to “collective begging”. In 2009, the European Court of Human Rights recognized the existence of a right to strike as an essential corollary to the right of freedom of association protected by ILO Convention 87 in a case related to Turkey. National governments worldwide have adopted a similar approach. ITUC’s brief identifies at least 90 nations which have confirmed the right to strike in their constitutions. The hardened employer line can be seen as one part of the broader assault by anti-union companies and governments against workers’ rights. It is also an attempt to weaken the ILO whose Conventions are increasingly used as references around the world when defining the scope of rights. The global union movement remains determined to defend the fundamental right to strike all over the world, and ILO’s Conventions as the cornerstone of workers’ rights.